This state-of-the-art facility, purpose-built to spark interaction and a collision of ideas, was made possible by a transformational gift by the late Dawn M. Greene and the Jerome L. Greene Foundation. The Jerome L. Greene Science Center, home of Columbia's Zuckerman Institute (Credit: Frank Oudeman/Columbia University). A center for scientific discovery. Columbia’s 450,000-square-foot Jerome L. Greene Science Center, home to the Mortimer B. Zuckerman Mind Brain Behavior Institute, is designed for the kind of social interaction and interdisciplinary thought among a diversity of scholars that is essential for new ideas to thrive. Its transparency and public spaces open the world of brain science to a wider community beyond campus. The mechanisms of the brain, the workings of the mind, the complexities of human behavior — these are the challenges that define the scientific frontier for Columbia's Zuckerman Institute. Grasping the implications for the health of the brain, mind and nervous system is perhaps the greatest challenge facing 21st-century science. The Zuckerman Institute brings together a constellation of neuroscientists, engineers, statisticians, psychologists and other scholars from across Columbia University and around the world who collaborate on research, teaching and public programming. By providing unrivaled facilities and encouraging cross-disciplinary interaction, the building will enable advances in inquiries ranging from the biology of disorders such as Alzheimer’s and Parkinson’s to investigations that bring together computer science, economics, law, the arts and social policy. Double-height meeting and interactive spaces (Credit: Frank Oudeman). The nine-story structure is the largest that Columbia has ever built and the biggest academic science building in New York City. 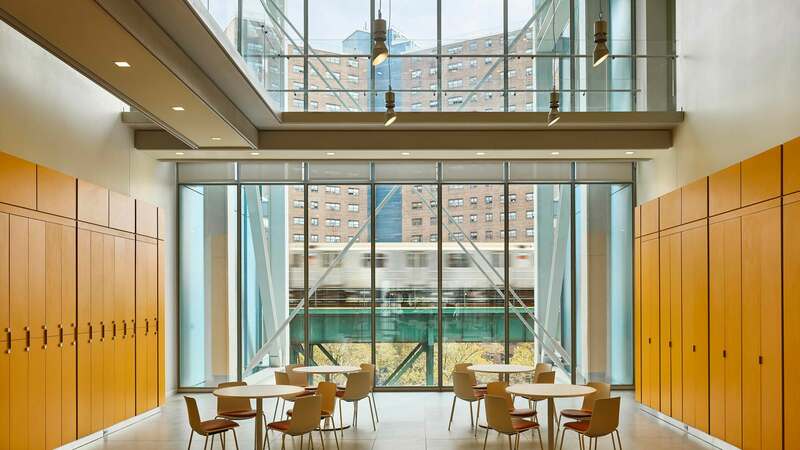 Designed by Pritzker Prize–winning architect Renzo Piano Building Workshop with Davis Brody Bond, LLP as executive architect and Body Lawson Associates, a Harlem-based certified Minority Business Enterprise (MBE), as associate architect, the Greene Science Center creates innovative spaces that fuel a collision of ideas. Inviting social spaces will bring faculty, scholars and students together to share ideas, hear new perspectives and generate fresh insights. Stairways that pair floors and spaces with communal facilities and a floor plan that groups the labs of scientists with similar areas of inquiry will help foster collaboration among fellow researchers. Renzo Piano spent many hours in conversation with Columbia neuroscientists before sketching designs for the Greene Science Center. They saw a need to create quiet spaces for concentration and open space where people and ideas from various disciplines can come together — as well as shared public spaces for those from the University and local community. The key to Piano's plan is to embrace the intersection of the City and the University. "The university of the 21st century," he says, “is not a fortified citadel and Columbia University in New York City has always been an example of the urban university, in contact with a complex social reality." Jerry believed in education, especially a Columbia education, and he believed in New York and its future...The creation of a building for the Mind, Brain and Behavior Initiative struck me as the perfect coming together of all his interests. Late philanthropist, on the gift honoring her husband, Jerome L. Greene.